The purchase of a brand new featherbed can be quite exciting, especially if you've never owned one before. Like any type of down bedding, featherbeds require just a little bit of extra care and treatment before you use them for the first time. Take a look at this article to learn how to set up a featherbed. Take your new featherbed out of its packaging and examine it carefully for tears or gaps in the ticking that would allow down to escape. You can get the loft in your featherbed to raise either by shaking it out or by tumbling it in your dryer for a few minutes on low heat. Air out your new featherbed on a clothesline or clean surface. Make sure you keep your featherbed out of direct sunlight. Put a fitted sheet on your mattress if you haven’t already done so. A featherbed is a mattress topper that lies on top of your mattress like a large down pillow, so it can shift as you sleep. Make sure that the down in your featherbed is evenly distributed. Most featherbeds have baffles (stitched squares, vertical channels or circular patterns) that prevent the down from gravitating to one side of the featherbed disproportionately. However, if your featherbed has channeled baffles or gussets, you may need to manually shift the down so that it’s evenly distributed. Put a cover on your featherbed. Although featherbeds can be spot-cleaned for small stains, they must otherwise be dry cleaned. 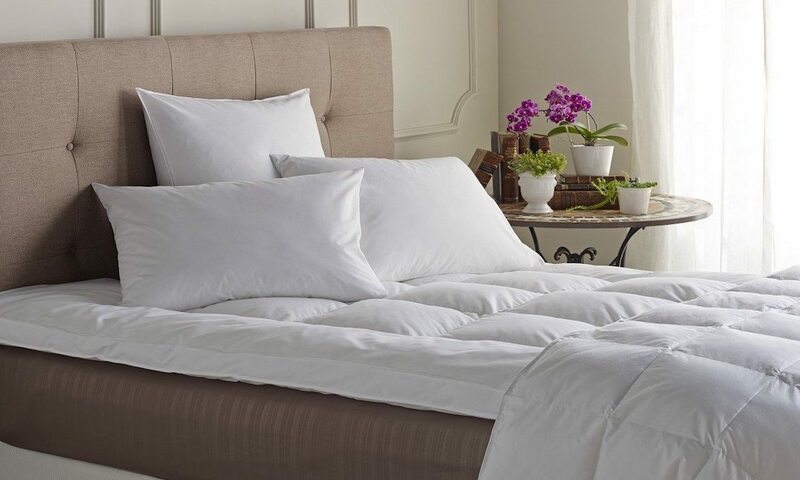 A cotton cover will extend the life of your featherbed as well as cut down on cleaning charges. To put a cover on your featherbed, simply turn the cover inside out and place it on the bed’s mattress. Put the featherbed on top of the cover, tucking the corners of the featherbed into the corners of the cover. Pull the cover over the featherbed so that the cover is right side out. Zip, button or fasten the ties of the cover securely. Place the covered featherbed on the bed mattress and then place the top sheet on the bed. Because featherbeds add considerable height that may prevent a top sheet from covering the entire bed, it may be helpful to select a sheet size that’s one size larger than your mattress, or alternately, an extra-long top sheet.